« A truly working small model biosphere. Not only should we practice ecological awareness, but we must acknowledge the new realization that the economy is a mere subset of the Earth’s ecological systems. As mankind came to realize the world was round, new visions and new technologies explored new and wonderful possibilities. But in managing our well-being, the discipline of economics has remained constrained to narrow models established more than 200 years ago using case studies in simple agriculture, cottage industry and even primitive hunting. Economics pretends that human demand and supply is the center of the universe. Because the people who make up theories, policies and rules about money also make money, they have been reluctant to change. They have treated environmental issues as peripheral nuisances that inhibit profits. But now it dawns that their precious model of circulating production and consumption is just a cog within the Earth’s great environmental service systems. 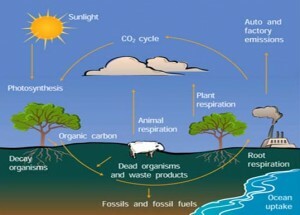 Economic’s “circular flow” between production and demand exists in and is driven by the Earth’s much greater natural cycles, and in particular by the carbon cycle. Until now environment measured physically (IPCC uses tons of carbon atoms) is difficult to reconcile with economic activity (measured in dollars). Some researchers have tried to bridge the gap by applying energy accounting to economic processes. The best attempts estimated not only energy directly used but also the energy embodied in commodities and machines from earlier steps of production. 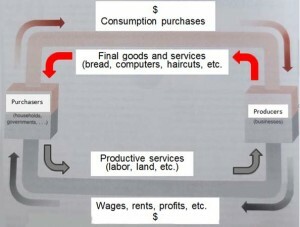 However various definitions of “energy” confused results, and conventional economists pointed out that the input of energy was merely one factor of production. From an economic point of view what is seen as “energy” to be treated as factors of production only leads to confusion. Energy hides more than it reveals. All but one of the forces of nature work for free for humans and should not be counted as costs. The Earth possesses momentum of rotation round the sun and spin on its axis (2.66 x 1044kg/m2/sec and 7.07 x 1033kg/m2/sec respectively) providing seasons, day and night and the circulation of air and oceans. The force of gravity is also ubiquitous, the antithesis of a scarce good, and has no cost. The “strong force” that holds nuclei together and distinguishes the 92 kinds of atoms is also non-negotiable in the marketplace. Geothermal dynamics is a free service. The electromagnetic force (emf) is the only force that we have any ability to change. To repeat for emphasis we cannot change the Earth’s momentum (or therefore its winds and currents), we cannot change gravity, and we cannot (practicably) change the strong nuclear force that makes each element special. In the emf there are also forms we cannot change such as sunlight. The one field where change can be managed is in the chemical bond between atoms. There is one specific exchange which drives economic activity. When carbon exchanges its bond with hydrogen for a bond with oxygen, chemical energy is released. 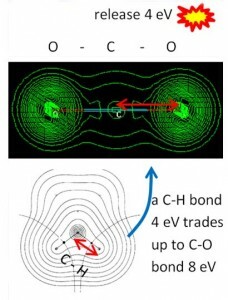 A C-H bond is evaluated at 4 electronvolts and a C-O bond is double that. To answer the question of what is the level of activity of a person, company, nation or the global economy, simple add the number of C-H bonds that were traded up to C-O in a certain time period. An individual consuming 0.75kg of carbohydrate and protein a day aspirates 3 x 1025 C-O bonds a day (as CO2). The global economy exchanged a number of C-H for C-O bonds in 2014 estimated to total 1.83 x 1039. It is a useful, pertinent question to inquire, what do people on Earth do? The objective, scientific answer is that they “do work”. “Work” was defined in physics in 1826 by Coriolis as the force expended (by a person, animal or machine) to lift a heavy bucket up a mine shaft against the force of gravity. Work is force times distance, W=Fd. To examine the economists “circular flow of the macroeconomy” in a clear objective way, all the goods and services said to be “produced” are simply the embodiment of the energy spent in converting C-H bonds in foods and fossil fuels to C-O bonds. There is no other cost – not wind, hydro, solar, geothermal, tidal energy are all free. The exception is nuclear energy which is excluded here for simplicity. This is disconcerting to bankers but the physical economic activity on Earth is analogous to observing the activities of ants. Ants also have an economy of harvesting, transport, construction, and even defense. Only their physical activity can be measured even though they have abstractions comprehended in our world as debt obligations, insurance and welfare. For economists to concentrate on financial data while dismissing physical reality is to submit to the trap described by Plato in interpreting shadows not only when they are the only signals, but to be prisoners of a mental set to the extent they still are mesmerized by shadows when shown solid reality. Thus there is a realization that the circulatory systems of Earth can be harnessed and the human economy has been a small spinoff, with for many thousands of years up to 1750, the carbon bond trading by humans only from organic carbon – carbohydrates, proteins and various forms of biomass. The industrial revolution seemed to introduce totally new technologies but the driving force of economic activity remained the combustion that exchanged the C-H for C-O bond. Adopting this perspective, the global carbon cycle and the circular flow of what economists think of as production and consumption can be fitted on the same page with the same units as shown in Figure 3. Measuring carbon bonds is even more challenging than the IPCC approach which counts gigatons of single carbon atoms. Chemical bonds are truly invisible and massless, like the attractive force between two magnets. In emissions, the carbon in CO2 has bonds either side with oxygen atoms. The C-H bonds which were broken before the forming of O-C-O are about half the strength, and can come from hydrocarbon fuels or biological fuels – carbohydrates or proteins. Only in the simplest hydrocarbon, CH4, is it definitive that each carbon atom has 4 bonds extending out to form a tetrahedron with hydrogen atoms spaced as far away from each other as possible (they repel each other). Other fuels typically have only 2 bonds per carbon atom (oils) or down to 2 carbon atom to one hydrogen atom (coals of diverse and complex structures). The C-H bond is a relatively unifor m universal currency regardless of whether it is corn or coal. In 2014, the C-H bonds broken and exchanged for C-O bonds by human volition, in feeding themselves and fueling engines totaled about 1.83 x 1039. The entire globe in 1 year captures 1.23 x 1040 C-O bonds in photosynthesis and in a 2-step process locks them into the carbohydrates of plants. 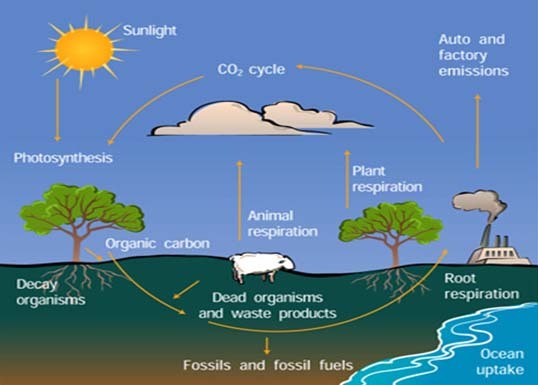 The other half of the cycle is the decay and respiration of organic matter, while the cycle is also copied in oceans with a carbon gas exchange of about 8 x 1039 carbon bonds per year. These numbers are so large as to be incomprehensible, like Greek debt, and a common unit is sought to allow sensible analysis. Justification for what may seem quirky accounting was found in the engineers’ quest to quantify the power of steam engines, newly invented 200 years ago. They were compared to the power of a horse able to lift 100 pounds up a mine shaft 220 feet in 1 minute, and this became the definition of 1 horsepower. Indeed a quaint origin when scientists now rate the Space Shuttle engines at 37 million hp. Even more everyday than a horse was 200 years ago, everybody can imagine 100 grams of their favorite staple food – a bun, bowl of rice or slices of bread. Simple uniform carbohydrate rates at 920 kilojoules per 100 g and consists of 4 x 1024 C-H bonds that, in digestion, exchange and lock in as C-O bonds, releasing 4 eV per bond. This standard food makes more sense than the “Big Mac index” popularized by The Economist journal. 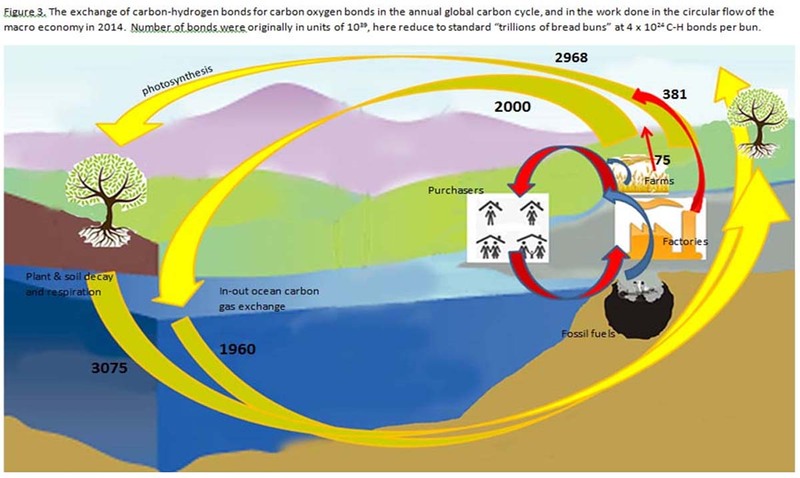 To deal with the United Nations perspective on annual global carbon cycles, and compare with the work done in the global economy, the lingua franca is “billion buns”. The plain, simple numbers are those highlighted in Table 1 and also set out on the flows in Figure 3. Fitting the global economy into the global environment not only makes us more “civilized”, but revolutionizes thinking. It is humbling for humans to finally fathom that in the carbon cycle and water cycle, oxygen is a waste product that accumulated over the last billion years. Awareness also should restrain us from the condescending throwaway line that some product is “environmentally friendly”, as if we are doing the environment a favor being friendly to it. It is our mother. Finally, though this will make bankers and the financial fraternity reel in horror, it is a reasonable proposition that the valuation of a standard bun at US 10 cents (in most countries) makes more sense than valuing GDPs in currencies that have been vigorously “stimulated”. At 10 cents per bun, the cost of the work done in the global economy in 2014 was about $45 trillion, while the carbon traded in Nature in the global carbon cycle was around $500 trillion.